On Tuesday, December 18th the Smithville Junior High eighth grade class had the great privilege of taking a field trip to the Holocaust Museum of San Antonio. While at the museum the students were divided into groups to meet with docents and volunteers in interactive sessions to learn about the Holocaust and the dangers of being a bystander. In one session they viewed and discussed art created by Jewish prisoners while imprisoned in the camps. In another session a docent showed and explained various Holocaust artifacts such as the yellow star Jewish people had to wear and a used can of the Zyklon B gas that was used in the concentration camp gas chambers. The highlight of the day was hearing 91 year old Auschwitz survivor Anna Rado speak to the kids, her story of being forced to live in a ghetto in Hungary and eventually be transported to Auschwitz was both powerful and moving. When she was done speaking the students spontaneously went forward, anxious to hug her and take a picture with her. 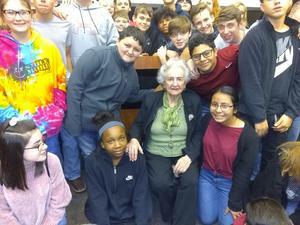 Eighth grader Steeley Earp said “Her story of losing her parents at Auschwitz taught me to always be thankful for the people I love and never take them for granted.” As Mrs. Rado urged the students to remember her story and carry it on for the next generation our students promised to never forget what they heard. It was a once in a lifetime experience, and one that won’t soon be forgotten.